The University of the West of England held its annual Fresher Fair on September 16, 2016. “Fresher fairs” are held on university campuses throughout Britain at this time of year as part of orientation activities for new students. 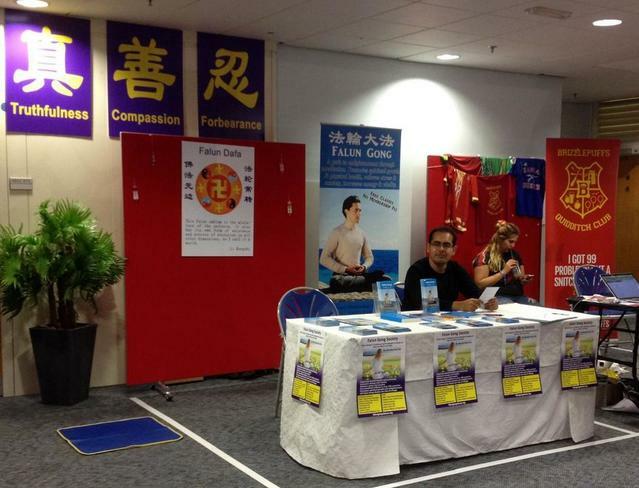 The student-run Falun Gong Club participated in the fair for the second year. The club set up a booth, as did numerous other student organizations. Practitioners demonstrated the Falun Gong exercises with the peaceful music playing softly in the background. The three words Truthfulness-Compassion-Forbearance, the principles of Falun Gong, were posted for all to see in both Chinese and English. Many undergraduate students paused to learn more about Falun Gong. Nearly 140 people registered to join the club. Some professors and staffers expressed interest and asked when and how to practice meditation. They know that Falun Gong is being brutally persecuted in China. Many Chinese students were surprised to see the Falun Gong stand. They nervously took photos, new to the freedom of the West. Some stepped forward to ask about the persecution in China. They stated that there was only negative news about Falun Gong in China. Different from previous years, some students who had learned about the persecution took the initiative to explain to their peers who had not heard about the persecution. Five Falun Gong Clubs have been set up in Britain over the last two years. More and more people are becoming interested in the practice, and many lend their support to end the persecution. The clubs will participate in more events on their respective campuses to raise awareness about the persecution.